This would even allow for some kind of gradient color request...and it chooses the most suiting (,0human perceived) color. Did not try it visually but maybe it somewhen comes as a handy helper. Nonetheless the colors differ so much that certain gradients look different when adjusted ... Or some color mixes now work which were not possible before (because of the vibrance of these "wrong/godot" colors). Will adjust the images when I get next spare time without other bugs to squash or interruptions by the kids who do not want to sleep as good as we parents want it :-p.
New evening with some hours of sparetime (yeah!) ends now (dizzy ;-)). - techtree modifiers adjusted for better value "steps"
I thought of adding "cloaks" so players would not see others ships until they approach near a player's planet. This would on the one hand lower "gpu stress" (less stuff to render) but is imho something "annoying" (surprise 200 ships approaching). 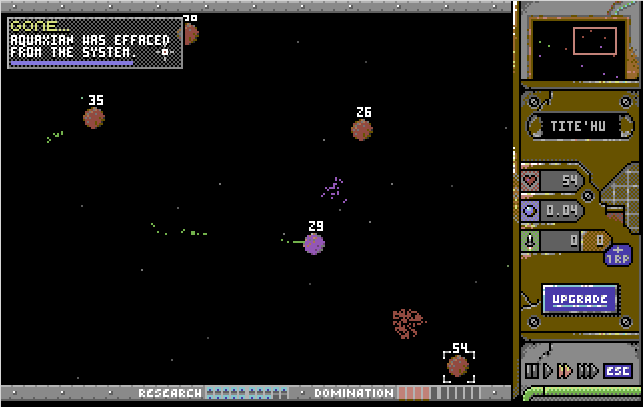 So I think the planetary defense (only some rockets...) should do for now. 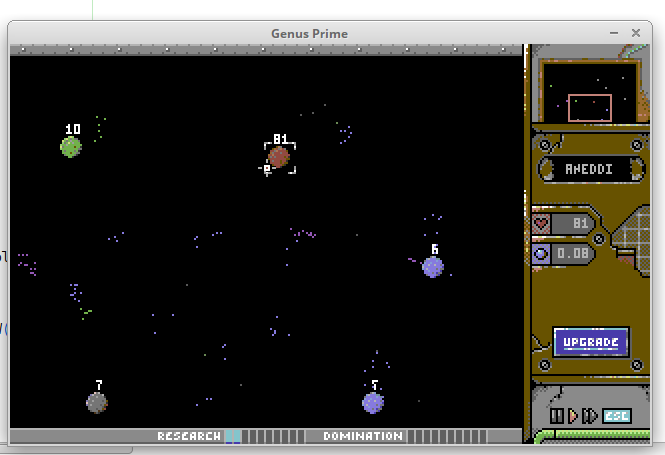 And yes - the missiles are also able to attack nearby planets. Will have to try the next lunch break if this is a suitable idea too. Should remind myself to not fell into the "feature creep issue". Still not sure how to include the planetary upgrade (for now its only useful to have the planetary defense there...) into the interface. Think the "upgrade button"/"knowledge hub" (window to upgrade "all planets/global") does have to stay there all the time. I initially thought to have it context sensitive: 1 planet selected: planet upgrade box. More or no planet selected: global upgrade box. Hmm so much for now. I thought of adding "cloaks" so players would not see others ships until they approach near a player's planet. This would on the one hand lower "gpu stress" (less stuff to render) but is imho something "annoying" (surprise 200 ships approaching). 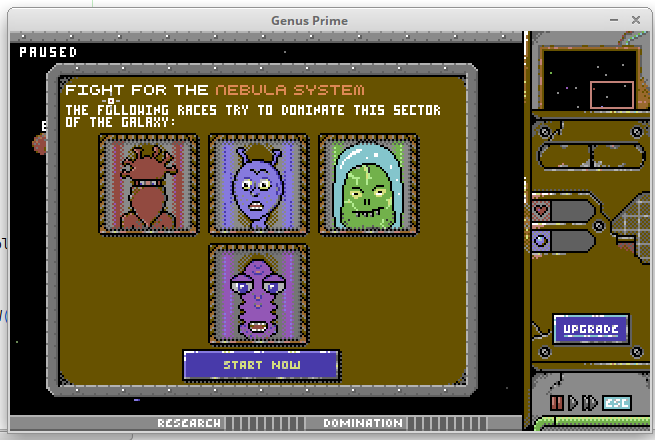 This game is making me think PSI5 trading company. That's the kind of attention to detail that floats my boat. Man I'm glad I have a GPD win 2, I can play all these games on the go ... neat. very solid stuff, i'm alway down for a bit of the old strat-sim games. PS: I am totally aware that the visual presentation is not what would be possible that way on the C64 (maybe some C64-magician could do but I surely break some "color block limits", sprite limits, ...). Think it is more a "low res c64 color palette"-entry. Don't be so sure, Derron. The c64 could multiplex sprites so, while not many would try to do it on a real C64, it's actually possible to write pixels as bit operations onto a sprite to simulate individual pixels. They could also be small and within range of each other if you were using multiple single colour sprites where needed so you didn't need to have double-width pixels. Agree, it's highly likely anyone would have gone to that much trouble during the C64 games heydays because of the coding headaches and memory required in the machine to do all that but it COULD have been done. Interesting game, now I've seen it moving. Kind of feels like PSI5 - as I said earlier - in looks but, gameplay-wise, I get a Megalomania feel along with Risk. Looking forward to playing it a lot more now. The only restriction was palette colours, this is not a competition to 100% replicate the original computer limitations (no fun in that!). Just look and feel. Minor question to you - as you know my mother tongue is not English so I am absolutely sure to choose the wrong words. So if a race in the game lost all its planets an ships in a system it does not mean that they are extinguished at all - they are just no longer present in that area. How to write that in a concise and short sentence? For now I use "NAME was effaced from the system." which isn't as "harsh" or is it? I want to avoid to have the game sound "brutal" at it would collide with the "cute" alien look. Maybe there is a "kind" word for pushing someone out of the room / exile / oust ... ? Removed or purged from the system. Removed from the system ... in passive then "XYZ was removed from the system" or "got removed" ? "XYZ was removed from the system" or "got removed" ? "XYZ was removed from the system" is better English. For what you want I think it's appropriate. You're welcome. lol yes purged is more forceful.